Active Components: Gentian is rich in bitter components, especially amarogentin and gentioprcrin glycosides. Even if aided by water in a proportion of 1:50000 their presence can be felt. Additionally to boosting saliva excretion and hydrochloric acid production in the stomach, these components are used for liver conditions. 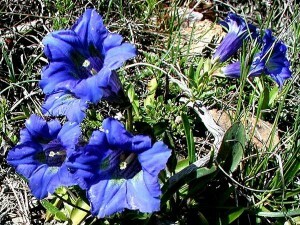 History: Gentian root and its bitter alternative have been highly popular in Europe, and applied to stimulate digestion (famous Swedish digestives include gentian). Conventionally this herb has also been applied for diarrhea, fever reduction, and skin inflammations. Its capacity to stimulate the gastro-intestinal tract and induce stomach juice excretion has been proven recently. Used for: The remedy is used to stimulate stomach activity, induce bile movement, and kill bowel helminthes. It is effective in treating decreased appetite and indigestion. Gentian cleanses the blood, helps cure liver conditions, increases appetite, improves digestive functionality, treats spleen conditions, jaundice, and dysentery. Additionally applied for reproductive system conditions, circulatory problems, stomach cramps, heartburn, indigestion, gastritis and body weakness. Serves as an aid in irregular menses, dyspepsia, scrofula, convulsions, gout, colds and fevers. Additional Info: The herb is indigenous to European, especially Turkish meadows. It is specially raised in North America. Its root is applied in herbal medicine. Its close relatives have the same medicinal capacity. Preparation and Intake: Dilute not more than 20 drops of gentian tincture in water, and take them 15 minutes prior to food intake. Safety: Gentian is not recommended to people with gastritis, stomach ulcers, heartburn, and high acid levels in the stomach.